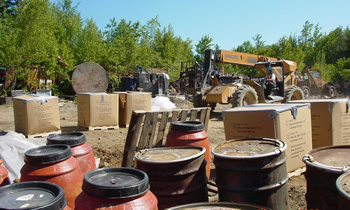 The Uncontrolled Hazardous Substance Sites Program (“USP”) was created to abate the threats to human health and the environment posed by abandoned hazardous substance contaminated sites. The USP is the state equivalent to US Environmental Protection Agency’s (USEPA) Federal Superfund Program. The USP has the authority to issue orders to responsible parties requiring them to conduct clean up actions. The Uncontrolled Sites program is one of several Department programs that evaluates and mitigates discharges of hazardous substances into the environment. Program jurisdiction for a particular site or discharge location is usually determined by nature of the discharge or the entity that is completing the investigation and clean up. This can include that entity that caused the spill, a potential purchaser of a piece of property already contaminated by hazardous substances, or the federal government. See Related Programs below. The Uncontrolled Sites Program also works with US EPA’s Site Assessment Program and US EPA’s Environmental Response Team to evaluate sites for potential federal assistance, including emergency response action or possible listing of a site on the USEPA National Priorities List (NPL). Chapter 13-B : UNCONTROLLED HAZARDOUS SUBSTANCE SITES §1361 - §1371. Response to emergency spills and discharges of hazardous substances and petroleum are overseen by the Department’s Emergency Spill Response Program. Sites with long term petroleum contamination only, such as leaking underground fuel storage tanks or leaking home heating oil tanks are handled by the Department’s Petroleum Remediation Program. Remediation Program Guidance: Guidance for the Investigation and Clean-up of Contaminated Sites in Maine. The Division of Remediation’s Quality Assurance Plan outlines the Division’s quality assurance guidance and standard operating procedures for data collection. The sites under the jurisdiction of the Programs within the Division of Remediation (including the Uncontrolled Sites Program) are listed in The Division of Remediation's Sites List Database. Also available is a map showing all Uncontrolled Site locations (along with all Remediation Sites). Believe you have a information regarding a hazardous substance site? Contact the Program Manager, Brian Beneski, by email or phone (207) 592-0248.